The tightly contested 1924 World Series would see the Washington Senators best the N.Y. Giants in seven games. 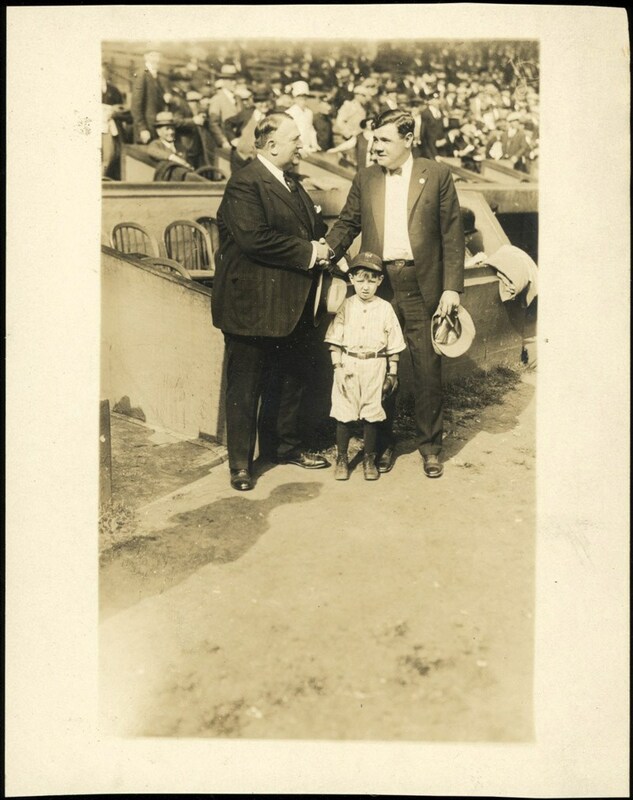 This outstanding George Grantham Bain image was taken before game #4 of that legendary Fall Classic on October 7, 1924, portraying Babe Ruth in formal attire shaking hands with "Big Bill" Edwards as the young Giants mascot stands between these two legends. Ruth's immortal standing needs no introduction as this "giant of a man" stood heads and heals above anyone who ever graced a baseball diamond. Regarding "Big Bill" Edwards, he was a former football star at the guard position for the Princeton University Tigers from 1896-1899. In the later 1910's, President Woodrow Wilson appointed him the Collector of Internal Revenue for New York's 2nd District, and in 1926 he was selected as the first president of the American Football League. 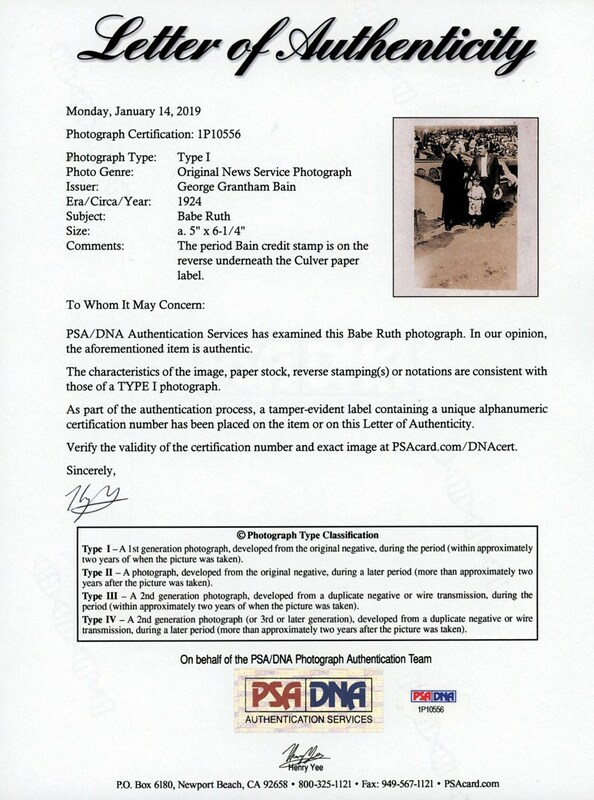 Regarding this obscure image, it measures approximately 5" x 6-1/4" and emanates outstanding contrast and resolution. Other than a few areas of toning, some negligible wrinkles and upper/lower edge trims, no glaring flaws are evident. 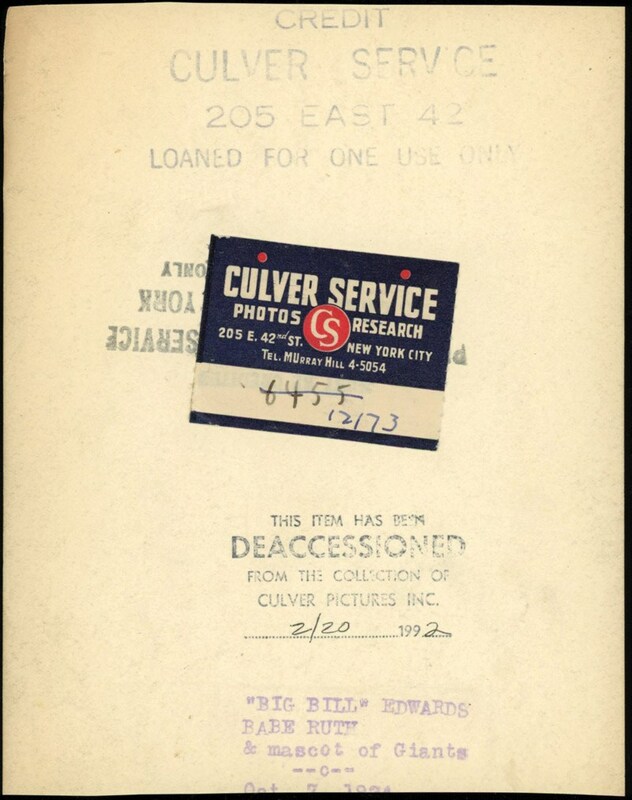 The verso includes an October 7, 1924 violet ink date as well as additional verbiage stating that "Big Bill" Edwards and the Giants Team mascot are included in the image with Babe Ruth.